Asia is a major source of opium and heroin for the world market, according to the U.N. Office on Drugs and Crime. Consequently, across Asia, most countries have adopted a severe stance against drug-related crime, and heavy penalties -- including capital punishment -- have been widely adopted. 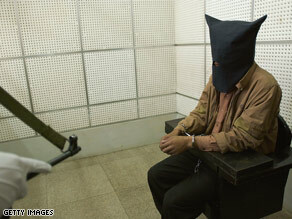 A Chinese policeman guards an illegal trafficker at a detention cell in Kunming, Yunnan Province, China. The punishment for offences even involving "soft drugs" are harsh and include long jail sentences. Penalties include the death penalty. Even those convicted of possessing small amounts of "soft drugs" for recreational use can suffer long jail sentences, heavy fines and deportation. While the Philippines re-abolished the death penalty in 2006, penalties for drug offences are still severe. Offenders convicted of possessing even small quantities of "soft drugs" receive mandatory jail terms. In Thailand, penalties for drug offences are severe and include the death penalty. The possession of even small quantities of "soft drugs" for recreational purposes can result in lengthy jail sentences and deportation. Under Vietnam's penal code, those caught in possession of even small quantities of heroin can receive the death sentence. Authorities have announced increased security and investigative measures to combat drug trafficking.